Joining the enviro-activists in chaining yourself to plant and machinery at a coal mine isn’t a great look, and the Australian Rugby Union won’t give you a second chance. Former Wallabies captain David Pocock has been charged over a protest against a coal mine in northern New South Wales. 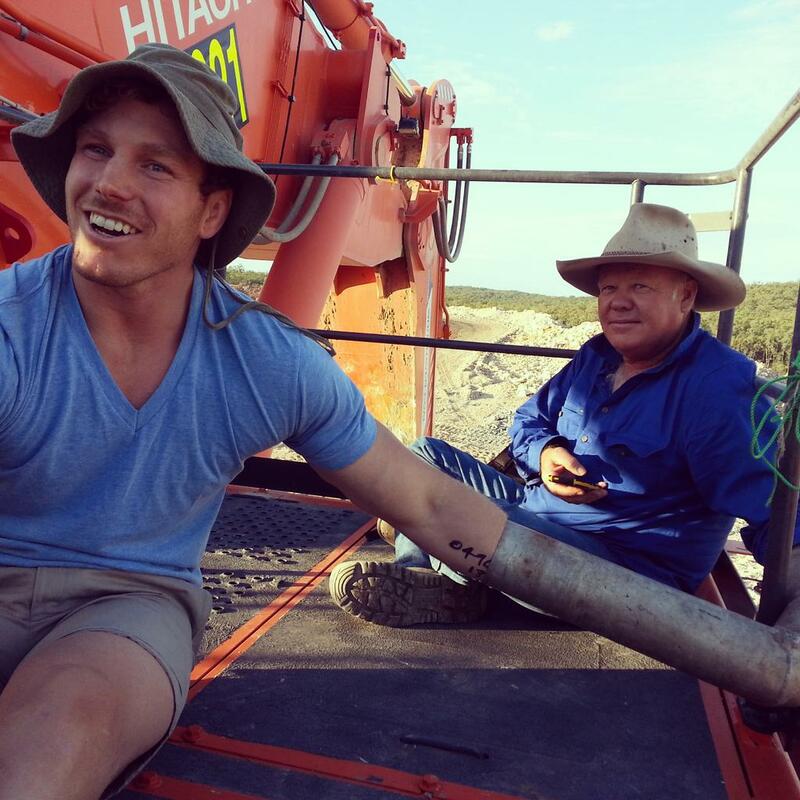 The ACT Brumbies player was among a group of seven who locked themselves on to digging equipment at Whitehaven Coal’s Maules Creek Mine site for 10 hours yesterday. Pocock, 26, and the other protesters have been charged with trespass, remaining on enclosed land without lawful excuse and hindering the working of mining equipment. All were granted conditional bail to face court in January. Pocock said he was aware he was likely to be arrested before joining the protest. “Those charges are something each of us has considered,” he said. 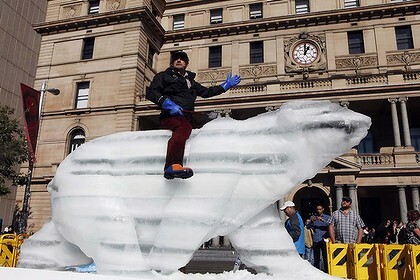 Carve a polar bear out of ice in the middle of Sydney. Watch it melt. Suddenly you believe in climate change. But wait, there’s more. They froze the ice around a bronze skeleton. In London. And then flew it to Australia. Really. In a plane. Which emits carbon. Honestly. I’m not making this up. Link. Discovery Channel gunman "inspired by Al Gore"
Lee has a history of protesting Discovery’s programming, saying it has little to do with saving the planet. 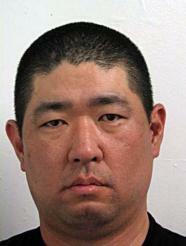 He was arrested outside the building in February 2008 after throwing thousands of dollars in the air. At the time, Lee was identified as being from San Diego, listing his address as a local homeless shelter. At his trial, he said he began working to save the planet after being laid off from his job in San Diego. He said he was inspired by Ishmael, a novel by environmentalist Daniel Quinn and by former Vice President Al Gore’s documentary An Inconvenient Truth. A real climate change victim, at last. Nepalese ministers arrived Thursday in Lukla, one of the main towns in the Everest region, ahead of a high-altitude cabinet meeting to stress the impact of global warming on the Himalayas. Nepal’s cabinet is due to hold a meeting on Friday on a plateau 5,262 metres (17,192 feet) high, in the shadow of Mount Everest, to draw attention to the effects of global warming before a key climate change summit in Copenhagen. Scientists say the Himalayan glaciers are melting at an alarming rate and creating huge glacial lakes that threaten to burst, devastating mountain communities downstream. They warn that the glaciers could disappear within decades, bringing drought to large swathes of Asia, where 1.3 billion people depend on rivers that originate in the Himalayas. The meeting has drawn comparisons with a stunt in the Maldives where ministers held an underwater cabinet meeting on October 17 to highlight the dangers of rising sea levels for the island nation. Nepali cabinet to "meet on Everest"
The Cabinet will meet at the Everest base camp later this month, just ahead of an international climate change conference next month in Copenhagen, Denmark, Forest and Soil Conservation Minister Deepak Bohara said. Prime Minister Madhav Kumar Nepal and other Cabinet members will fly by plane to the 5,300 metre camp [and the carbon footprint of that is, exactly? – Ed], the starting point for mountaineers attempting to climb the world’s highest mountain. Bohara said the meeting is an attempt to highlight the problem of melting glaciers in the Himalayas. Glaciers are melting at an alarming rate, creating lakes whose walls could burst and flood villages below. Melting ice and snow also make the routes for mountaineers less stable and more difficult to follow. [And that’s caused by climate change, of course. Couldn’t be anything else, oh no – Ed].